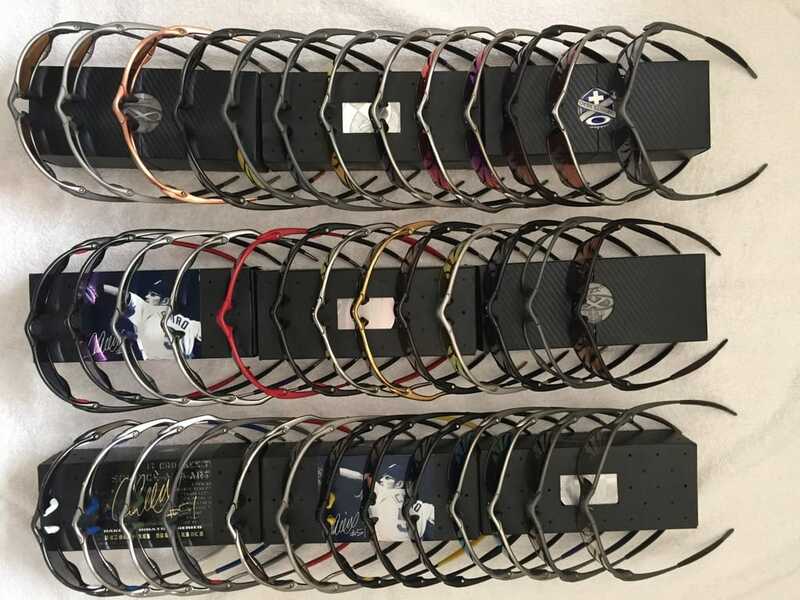 This month we’re delving into the world of the Oakley super fans and collectors checking out the awesome private collections some fans have accumulated across the years and and finding out from them first hand how, why, and when their love affair with Oakley began. 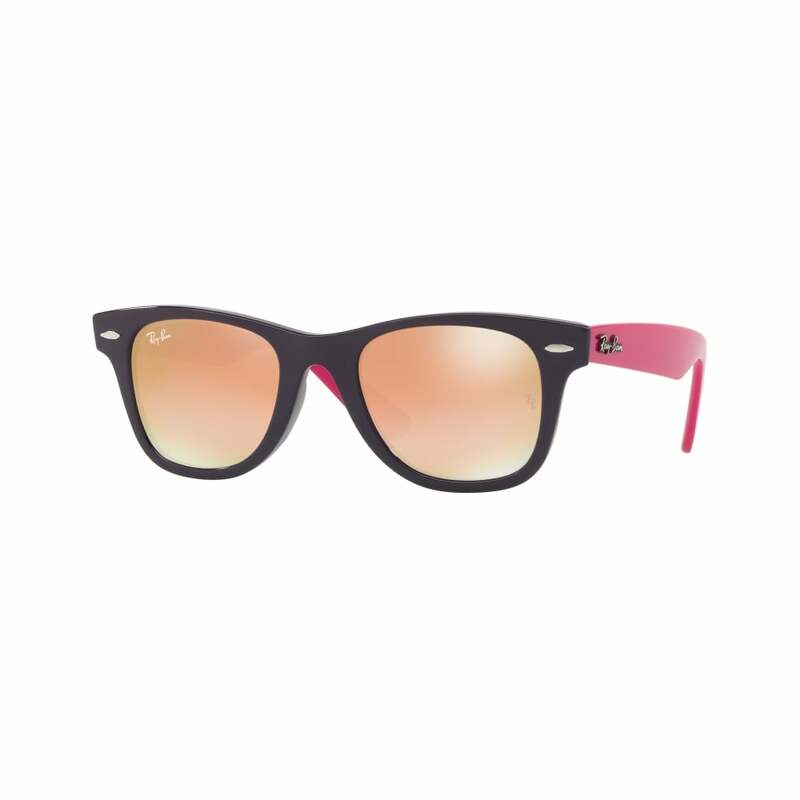 The customisable nature of Oakley products brings out the creative flair in their collectors. 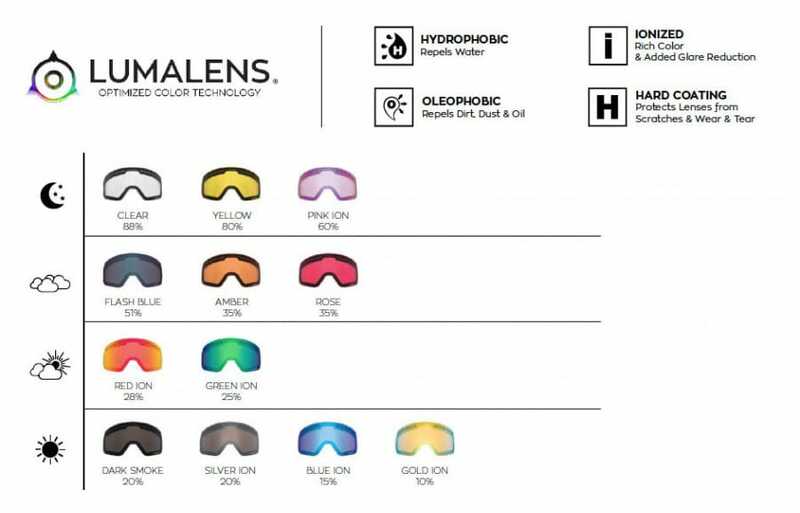 Able to tailor the frame colour, and lens type of most models Oakley super fans have come up with some of the most original and eye catching colour and performance combos we’ve ever seen. Being the brand that it is Oakley wasn’t slow to recognise this talent and encourage it by hosting collectors’ events in its stores. Collectors events showcase the cream of the crop when it comes to private collections, and bespoke product combinations. The events celebrate Oakley’s most iconic products (Medusa and Over The Top spring to mind!) let the truly O-bsessed get access to exclusives and pre-releases, and be part of the next launch of their latest designs. Exhibiting collectors are required to display a minimum of 30 pieces and no more than 45. 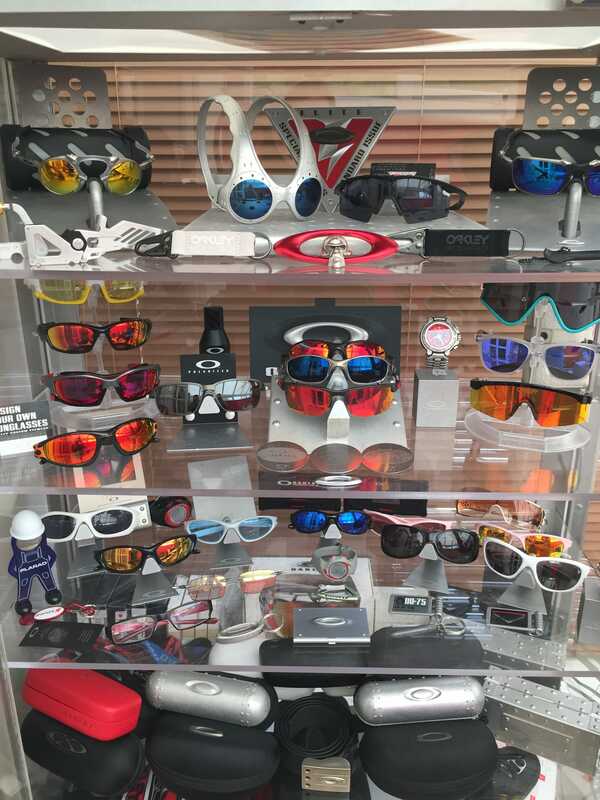 The collections are then judged by Oakley officials and prizes awarded for ‘Best Collection’ and ‘Best Singular Product’. 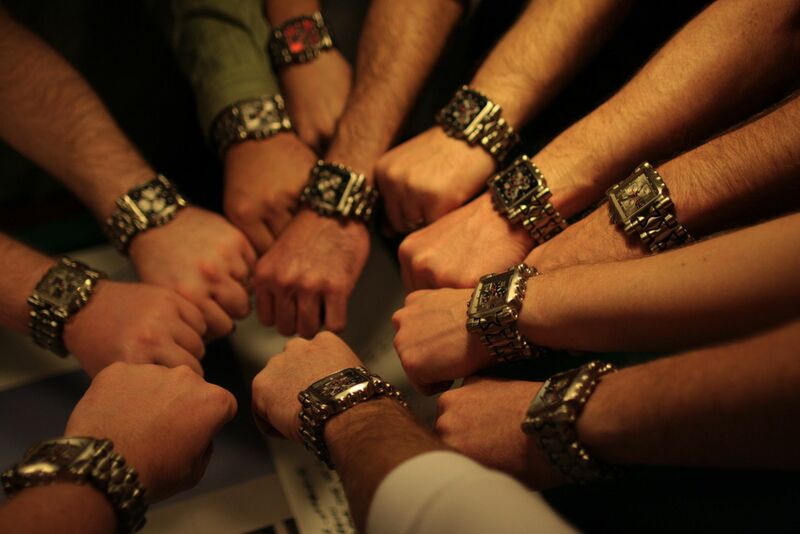 Collectors events are regularly held in the US, but we’re still waiting for the UK to catch up! Compared to some collections we’ve seen over the past few weeks ours is a minnow! We’ve been collecting M-Frames for the past 15 years because we’re mad keen cyclists and like to have a bash at the odd Ironman or triathlon now and again, because of that our purchases are based on function first, fashion second. 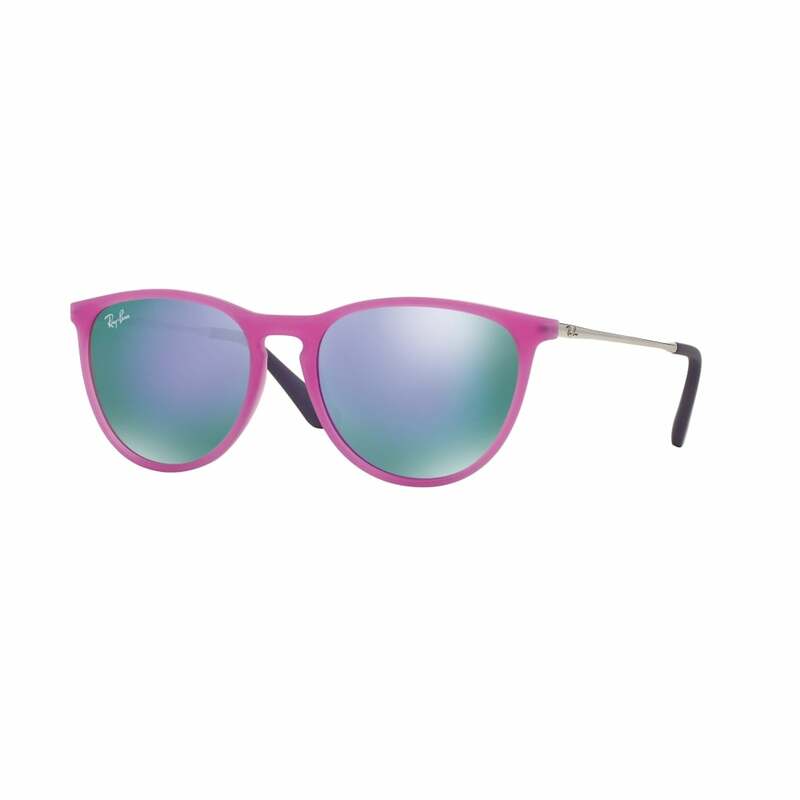 Our most prized pair from the 20 or so we’ve collected has to be our Pink Splatter framed ones, they are so 80’s, we love the retro look. Simon from Southend is a UK collector and has amassed around 35 pieces covering everything from Minutes through to X-Metal Mars. There’s Over the Tops in there and some grand old favourites like the Snow Jungle Trenchcoat and the Butterscotch Scar. Check out his collection, which piece would you give cabinet room to? For us those Trenchcoats are the ones we’d most like to own. 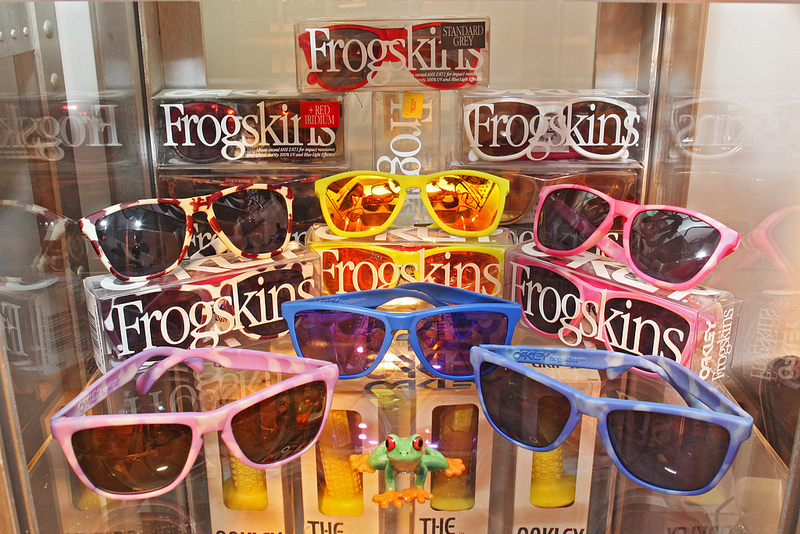 “I started out with a few pairs of Frogskin. Always admired the Juliet but I had other pairs doing the job, so didn’t buy any. Until a couple of years ago, when I thought I’d try one to see if it lived up to my expectations. Of course, with 40 pairs now, it very much did. I think it’s a classic design, with a lightness of touch that makes it wearable for either gender, not overtly masculine or feminine. 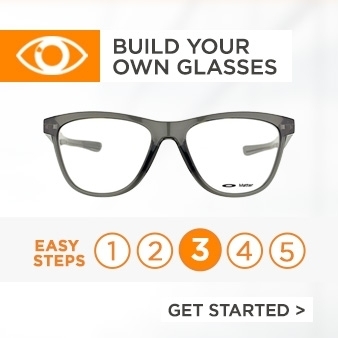 It’s out there design but with restraint, which isn’t the case for all Oakleys. It’s weighty, but a satisfying heft, rather than something you can only wear for half an hour. For us the pick of this bunch really has to be the custom plated copper pair, 3rd frame in from the left on the top row. Similar to the Copper X-Metal Penny. The metallic look sets off the design perfectly, nice skills Mark! It’s not just all about the products though, the O-experience extends to the stores too. 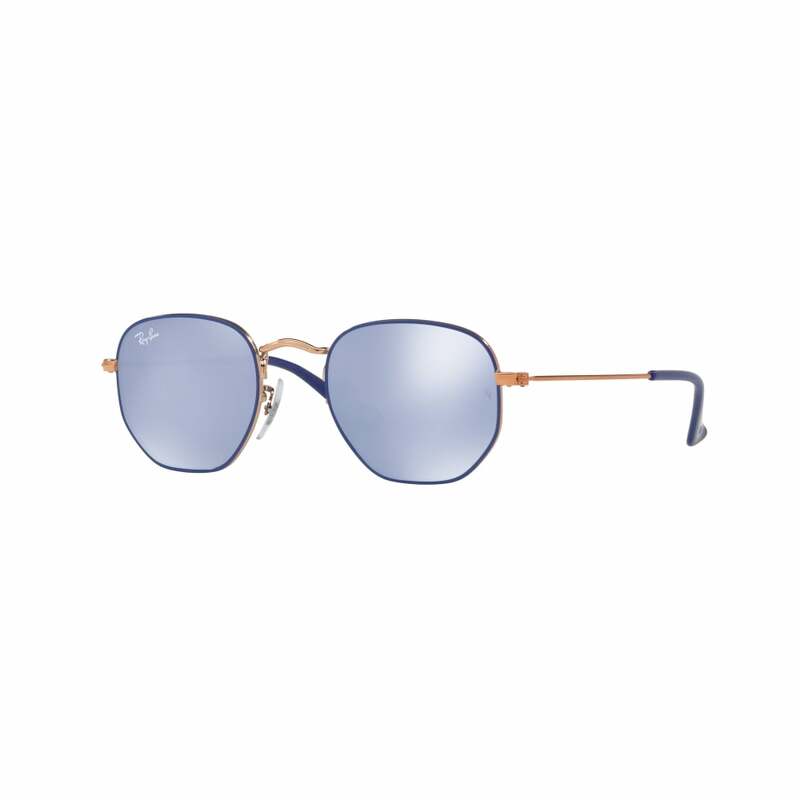 Oakley Vaults are a destination for super fans, a Mecca for eyewear enthusiasts they are the embodiment of all things Oakley. The staff, the décor, the shopping experience has been Oakley-ed to the max and no one knows this better than super fan Chris Hoiberg from the good old US of A.
Chris first became acquainted with the brand in his younger years when competing as a junior road cyclist, his love for the brand began when he purchased his first pair in 1997 and by 2004 he and his new wife were bona fide O-bsessed. From that point onwards Chris made it part of his agenda to try and visit a new Oakley store when on holiday or travelling for work. 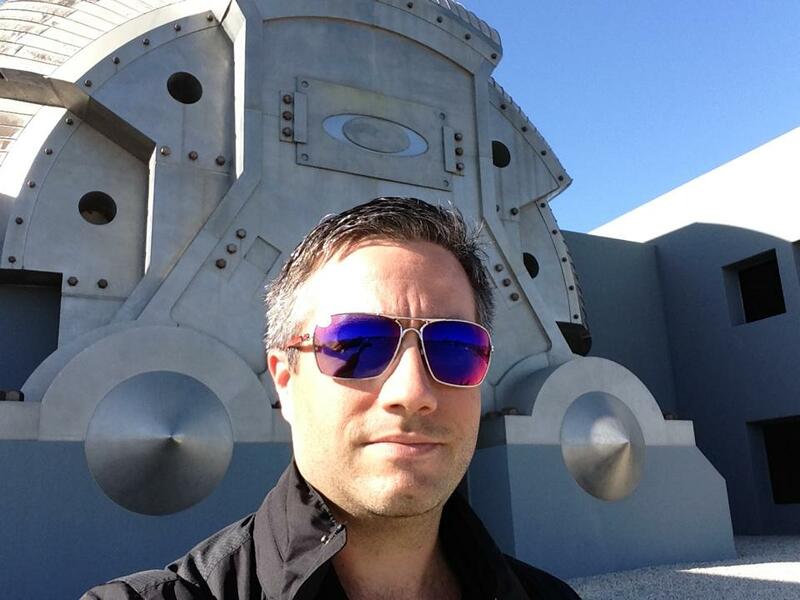 Fast forward to 2015 and Chris has visited over 96 Oakley stores and has the selfies to prove it. 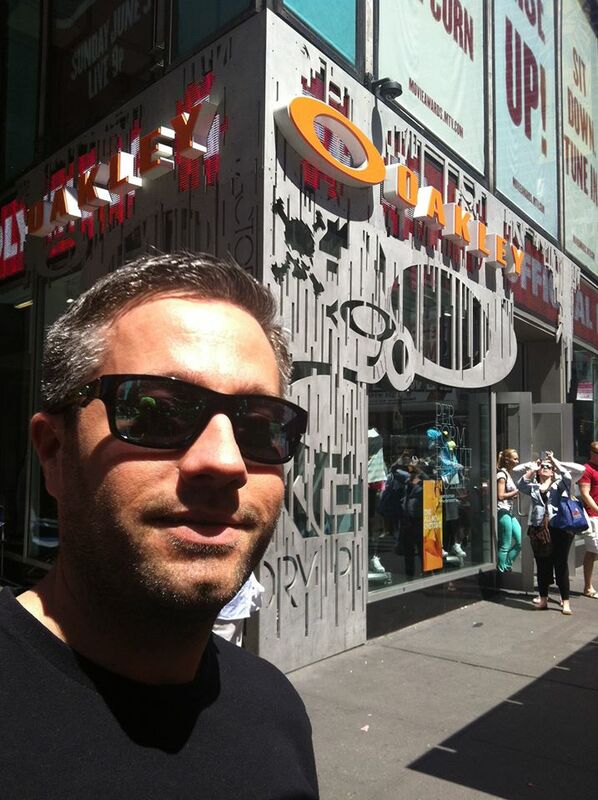 His Facebook album detailing each store front and with an essential Oakley selfie outside the shop is comprised of 425 photos. 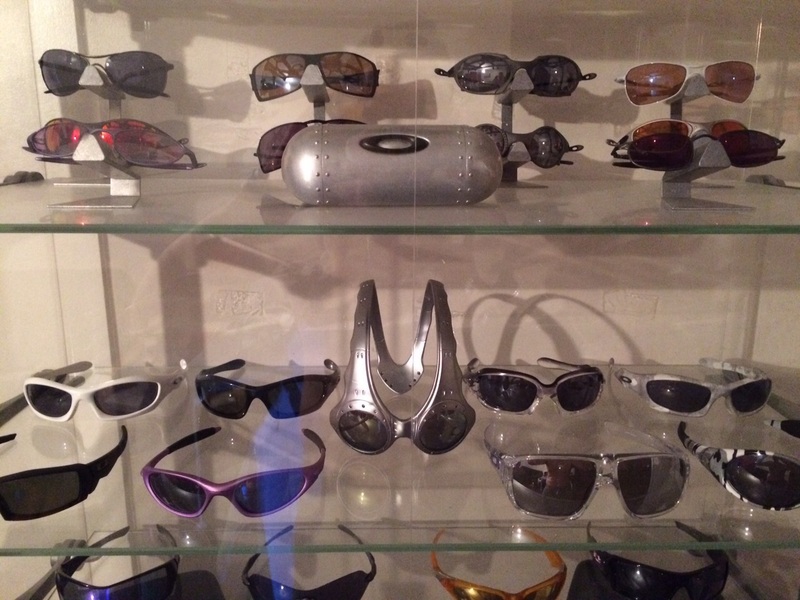 If you thought you were an Oakley fan, think again! Chris we salute you. 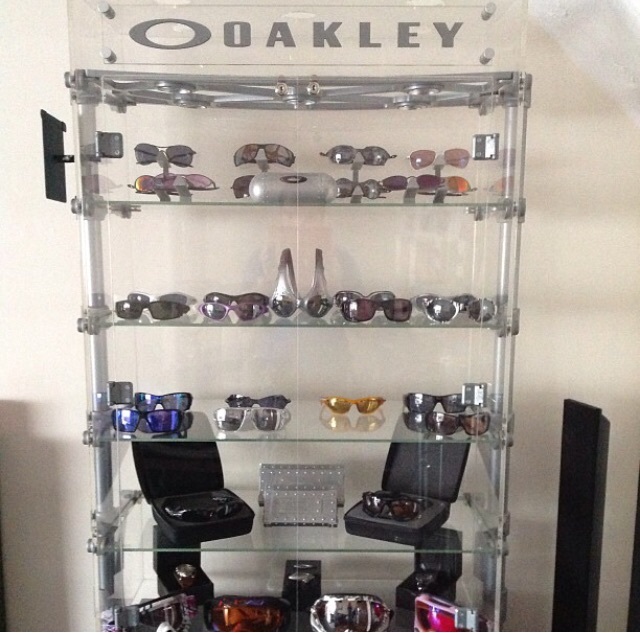 Tim from the UK takes his Oakley collection and super fandom to the next level! As a 14 year old he spotted his brother in a pair of Eye Jackets and immediately began saving up his pocket money to buy his own pair of Oakleys. His debut purchase was a pair of Minutes with black iridium lenses, he must have walked into school the next day with some serious swagger! Determined to wear them as much as possible Tim even managed to convince his mum to write him a note giving him permission to wear them during gym for ‘protection reasons’. Kudos to Tim’s mum for doing that, Oakley love obviously runs in the family! 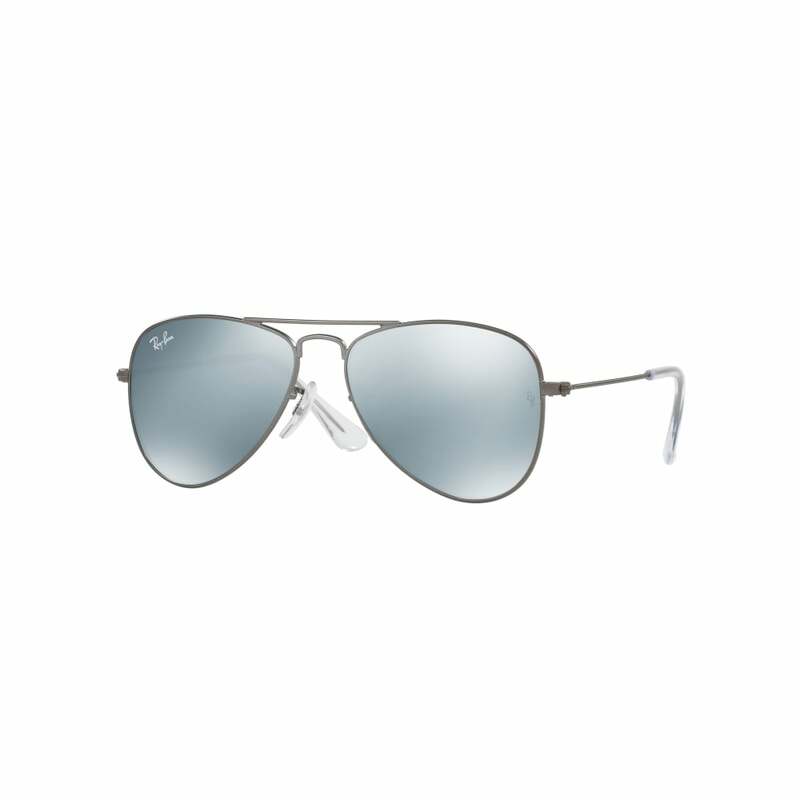 “Ever since then I have been hooked, I love the crazy design of Oakley products, defyingly different! 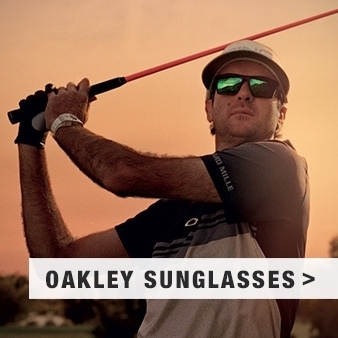 Over the years i have been known as ‘the Oakley guy’ from friends and family, and i have always spread the good word about Oakley, recommending all sorts of products to them. 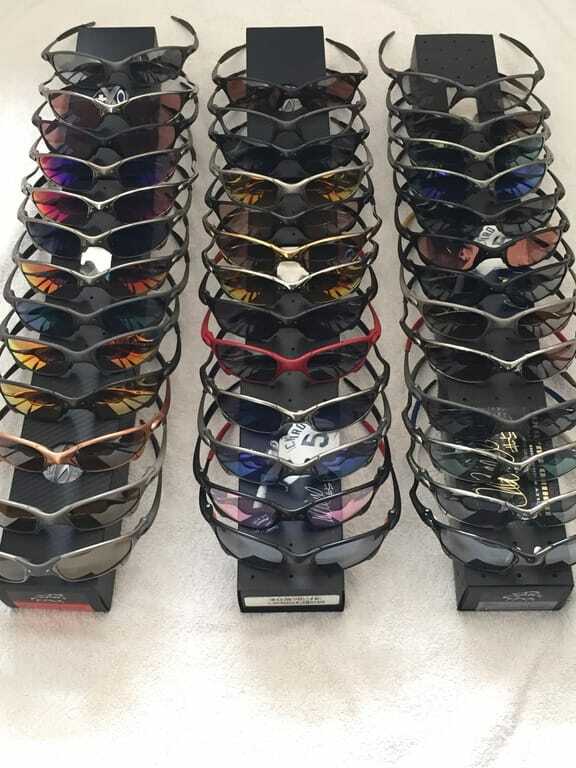 Tim’s collection currently comprises of 28 pairs of glasses (which we estimate to have cost in excess of £5,000 from new!! 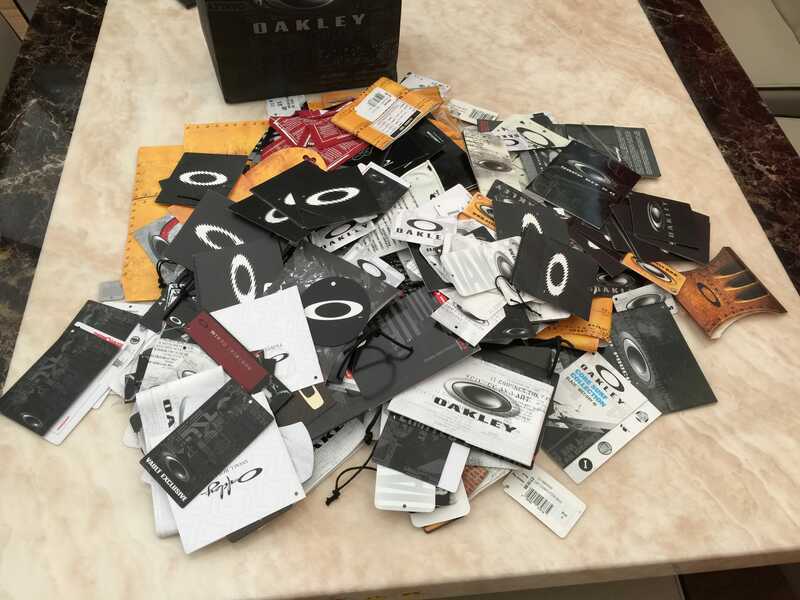 ), over 20 pairs of Oakley shoes and Military S.I. 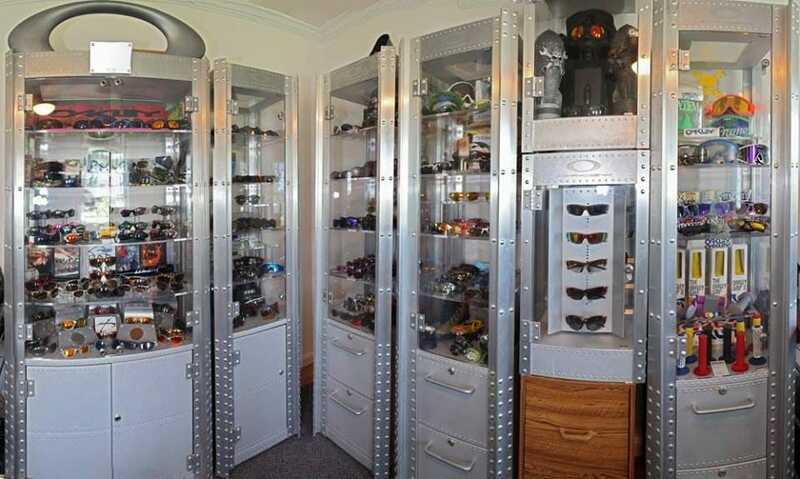 boots, a wardrobe almost exclusively full of Oakley clothing, 5 watches GMT, Crankcase, D1, D3 and his wife’s pink Crush. 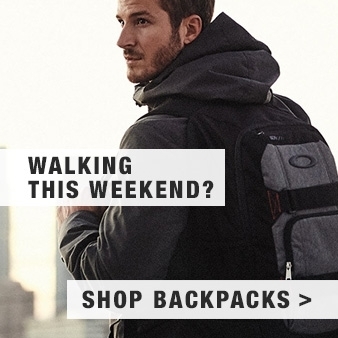 (although he used to own 2 limited edition timebomb watches – Eddie Jordan and Rusty Wallace) , a huge number of bags, backpacks, and smaller accessories, not to mention a host of promotional flyers and every single tag from every purchase since his first Oakley Icon t-shirt 17 years ago. 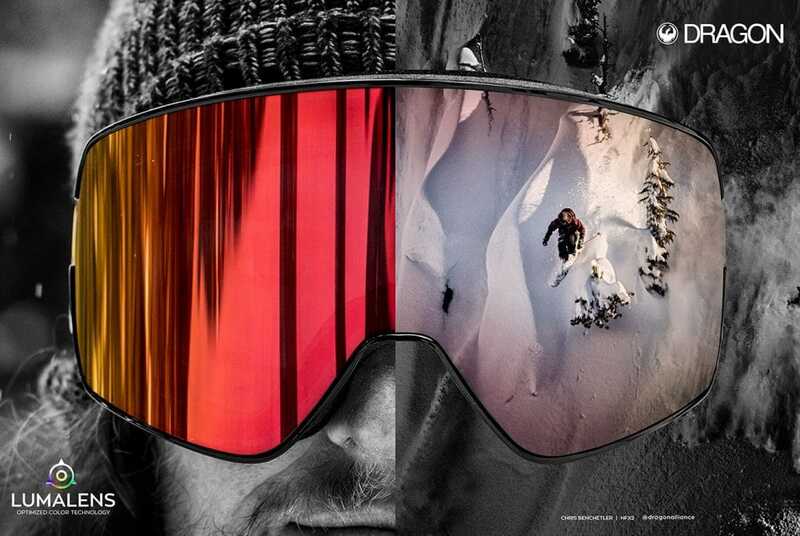 Some are drawn to Oakley because of its performance credentials, whilst others are first attracted to the brand as a result of its pioneering products. 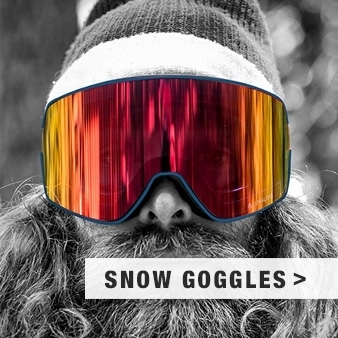 Once Oakley’s daring designs caught Dann from New England’s eye there was no going back. 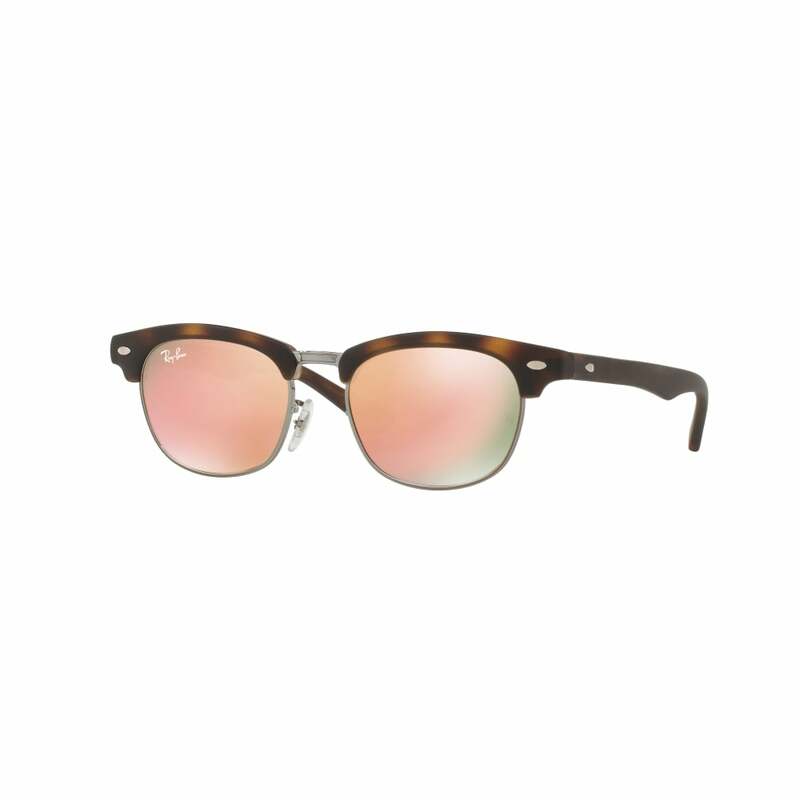 He ditched his student ways (buying sunglasses from petrol stations and convenience stores) and splashed out on a pair of Splice. The camaraderie of collecting really added to the appeal for Dann, he and his friends spurred each other on, and added to the joy of finding, buying and sharing with fellow O-fans the latest purchase. From head to toe Dann was hooked, he bought sunglasses, watches, clothing and footwear. Oakley even made an appearance on his wedding day when he wore his beloved Oakley Bow Tye’s down the aisle. Some shoes though are too good even for special occasions and as such his Jim Jannard Autographed Yellow Kevlar Shoeones remain ‘for display only’. Have you got what it take to claim Oakley super fan status? So you’ve seen what Tim, Simon, Chris, Mark and Dann have achieved with their collection how does yours shape up? We’re offering one lucky Oakley fan the chance to win a fantastic Oakley prize, click here for more details.